Although not really common in German-speaking parts of Europe, the name Vogler – “Fowler” – is at least familiar throughout that area and is used by many families which are usually unrelated and with nothing in common but that surname. Thus, even though the 10th-century Holy Roman Emperor Otto the Great’s father was the Saxon king Henry the Fowler (“Heinrich der Vogler,” still remembered today in a well-known German folksong), even though Robert Browning’s Victorian poem “Abt Vogler” has helped to preserve the memory of an 18th-century German priest and musician of that name, Philipp Christoph Vogler’s ancestors lived out their obscure but, one hopes, contented lives far to the south in northern Switzerland wihout any record of kinship or contact with other families using the same surname. Nor is it likely that any such association could ever be established, given the stability of the Oberhasli Voglers’ residence there over the centuries before their well-documented migration first to southwest Germany and then on to North American two generations later. Who were the first Oberhasli Voglers who can be identified as lineal ancestors of Philipp Christoph Vogler and his descendants? There is evidence that the Vogler name itself appears in local legal documents as early as 1455. However, systematic record-keeping for births and deaths was not established in Switzerland until late in the next century. As it happened, those Swiss cantons like Zurich that had gone over to the Protestant Reformation were the first to make such record-keeping a matter of public policy, since all parishes of the Swiss Reformed Church were also units of cantonal civil administration as well, an archival arrangement not generally used until much later in those cantons to the south which had remained predominately Roman Catholic. In the register of births and deaths for the Reformed parish of Niederhasli (to which the villages of Oberhasli and Mettmenhasli also belonged), the earliest entries date from 1599, so that births and deaths occurring before that year are not recorded there. But when Philipp Christoph Vogler’s line is traced back to that point, his paternal great-great-grandparents emerge for us there at the beginning of the 17th Century: Jogli (“Jacob”) Vogler and his wife Agly (“Agatha”), née Mart[h]aler, recorded as having been the parents of Philipp Christoph’s great-grandfather Ulrich, born in Oberhasli in 1631. The register than shows that Ulrich Vogler, having married Anna Vogel, was the father of Rudolf Vogler, also born in Oberhasli in 1657 and later to be Philipp Christoph’s grandfather after his own emigration from Switzerland to the town of Gondelsheim in what was then the German Palatinate, now a part of the modern state of Baden-Wuerttemberg in southwestern Germany. Although Rudolf remains a rather enigmatic figure in Vogler family history, it has recently been established that on 8 November 1681 (thus at the age of 24) he married his 18-year-old first wife Barbara Bockhorn from Albisrieden (Zurich), as recorded in the Niederhasli Swiss Reformed parish register. At some point during the next eight years, Rudolf and Barbara chose to emigrate from Switzerland to southwestern Germany, for her death in 1689 is recorded in the parish register at Bretten / Baden, a town lying just south of Gondelsheim. Six years later (1695), RudolfÂ’s name first appears in the Gondelsheim Lutheran parish register in the record of his marriage as a widower to the widow Anna Maria Strauss, with the birth records of their children then appearing over the next several years. Ironically, although the surname Vogler can be found in nearby communities in Canton Zurich, no one bearing that name is to be found today (1990s) in Oberhasli itself. In the churchyard outside the small Reformed chapel in Oberhasli, one can find the names of several Mart[h]alers and Vogels; but there is not a single grave marker bearing the Vogler name itself, even though the Historical and Biographical Dictionary of Switzerland speaks of that family as still “flourishing” there as late as 1934 when the volume containing its article on the Swiss Vogler families was published. About twenty miles (33 km.) east of the Rhine River and slightly less than that from the historic city of Karlsruhe, the town of Gondelsheim lies in the southwestern corner of modern Germany in a district now attached to the modern state of Baden-Wuerttemberg but long a part of the medieval Palatinate, one of a cluster of feudal domains making up the crazy-quilt jumble of the Holy Roman Empire prior to German unification as a single nation-state in the 19th Century. It was to this town that Rudolf Vogler made his way from Switzerland a little over 300 years ago, although no exact date has been determined for his arrival there. His name appears for the first time as a town resident in the Lutheran parish register on February 5, 1695, on the occasion of his marriage to the widow Anna Maria Strauss. Fifteen months later (1696), Rudolf’s first child by this new marriage was born, a daughter named Anna Barbara (perhaps in memory of his late first wife Barbara Bockhorn). But the parish register notes that her baptism had to be performed nearly a month later in another nearby town of Bretten, where Rudolf’s first wife had died seven years earlier, and by a Calvinist minister rather than the family’s Lutheran pastor because of the occupation of Gondelsheim itself by soldiers of Louis XIV’s French army during the then ongoing Nine Year’s War (or War of the League of Augsburg). In 1698, two years after Anna Barbara’s birth, the parish register reports the birth and baptism of Rudolf’s and Anna Maria’s first son, Hans Georg, who in turn was to become Philipp Christoph’s father 25 years later. Over the next ten years, three other daughters and another son were to be born to Rudolf and Anna Maria, all of whom died in early childhood. As a young man, Hans Georg married a woman named Catharina, by whom he was to have five sons and a daughter during the period from 1723 to 1732. Their first child was Philipp Christoph himself, born on April 2, 1723, and baptized soon after, according to the parish register. Philipp Christoph’s mother died in 1735, three weeks before the death of her Swiss father-in-law Rudolf. In July 1736 in the nearby town of Maulbronn, her widower Hans Georg married again, this time to a woman named Anna Maria Klingslin, by whom he had one child who survived infancy, a daugher named Maria Margaretha, born in 1738. This half-sister of Philipp Christoph’s was later to undertake a life of far-ranging migration that in some ways resembled his own, although hers was to take her in the opposite direction from his journey to North America, in her case to a new town made up of ethnic Germans in what is now northern Yugoslavia just south of the present Hungarian border and not far from the Rumanian border to the northeast. Among her Osswald descendants, some are known to have come at some point to the United States and to have settled in the area of Springfield, Ohio. In March 1742, Hans Georg and his then 19-year-old eldest son Philipp Christoph left Gondelsheim forever to join others who had been recruited to emigrate to North America, journeying across western Europe to the Dutch port of Rotterdam where they were to board the ship Lydia for the transatlantic crossing. After a brief call at the Channel port of Deal in England, the ship sailed westward into the North Atlantic on August 18, 1742, carrying our father-son team of ancestors off to a new life in America, first to Boston and then to Broad Bay on the Maine coast northeast of Portland. Europe was now behind them, and they would never return. To this date, nothing has yet been discovered as to why the rest of their family was left behind or what became of any of them after Hans Georg’s and Philipp Christoph’s departure. Another passenger on that same voyage was the then 10-year-old Anna Catharina Seitz with her family from Ötisheim, a town actually only a few miles southeast of Gondelsheim, although our Vogler ancestors seem not to have met this Seitz family while living in the same area. Four years later, however, those two families would be united in the marriage of Philipp Christoph and Anna Catharina at Louisbourg in faroff Nova Scotia during a successful campaign of English soldiers and English / German colonists to drive the French from that Gibraltar-like citadel that had been such a threat to the English settlements in New England. Lasting from 1745 to 1748, that leisurely operation had drawn both families to Cape Breton Island (part of Nova Scotia) from their new home at Broad Bay (now Waldoboro) on the coast of Maine (then a part of Massachusetts). With that marriage, our North American Vogler family would now evolve from that point and that extraordinary situation. 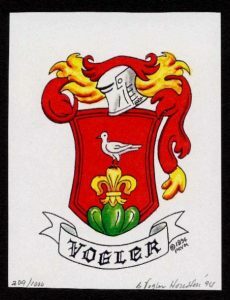 Our Vogler surname has origins dating back to the remote Middle Ages in German-speaking Europe. As the equivalent of the English surname Fowler, the word translates to mean “keeper of birds,” usually those associated with hunting, like falcons or hawks. There is no record of our Oberhasli ancestors ever using a coat-of-arms, however, a Vogler family in nearby Zurich did possess a coat of arms. That coat of arms was the basis for our modern Vogler coat of arms, designed by Betty Vogler Houston and officially adopted by the PCVF in July of 1993. Once in America, some of our ancestors living in English-speaking areas changed the surname spelling from “V” to “F” in order to maintain the German pronunciation. But, a majority of our ancestors living in predominately German-speaking parts of Maine and North Carolina chose to retain the “V” spelling. However, the original German “F” sound has long since given way to the now-familiar “V” sound when that surname is pronounced in this country.